I'm writing a novel and as my characters have swords as their weapon of choice, I thought I'd do some fact checking. 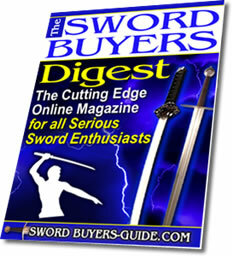 Trouble is there is so much to learn about the world of swords that I'm finding it overwhelming. I really hoping someone can answer a few direct questions? One of my characters is a weaponsmith, but I like the idea of him offering maintenance services as well as creating swords. Is this a 'normal' thing for a forge to offer, and what kind of maintenance could he offer (i.e. 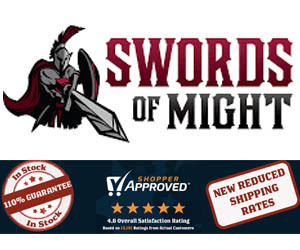 what is involved in sword upkeep that owners might not trust themselves to perform)? I'd also like to know if its common for a forge to 'sign' their weapons in some way, so that at one glance someone could tell who made the sword? Or is identity more in how the sword handles than how it looks? At what point does a sword become a dagger? Is there a particular length that separates the two, or are they built differently? 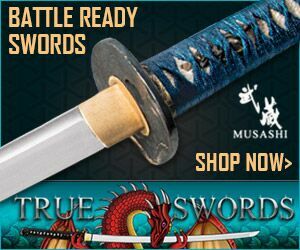 Is there a difference between a scabbard and a sheath? When carrying a sword around, is the belt considered part of the scabbard/sheath? Just for fun, what is your favourite sword and why? Phew, that is a lot of questions..! I will do my best to answer each one below, though as I am not certain what culture you are referring to, will try to cover as many varieties as possible. 1) Maintenance Services: No, usually a warrior knows basic to intermediate sword maintenance, such as straightening a bent blade, sharpening, oiling, fixing minor chips and dings, etc. If a sword needs re-profiling, in Japan they would take it to a Togishi - which is a specialist sword polisher. If it breaks, the polisher may re-profile it into a shorter blade (Ko Katana) - but the smiths job is only really to make the sword and then he is done - at a certain point a sword is considered "used up" and needs to be replaced. 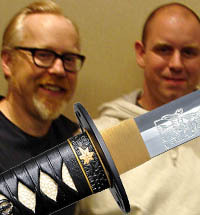 2) Sword Signatures: Yes, in Japan they sign their name on the tang. This means it cannot be seen unless the sword is taken apart (such as for maintenance). In the West, many swords have a "makers mark" - which was often roughly carved into the blade itself. 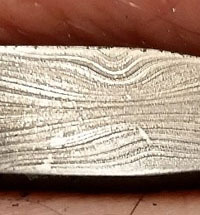 here is a link to more info on the different types of makers marks and stamps used to identify swords in the West. 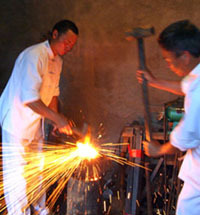 The Chinese often did something similar, carving the name of the smith in Chinese characters onto the blade. 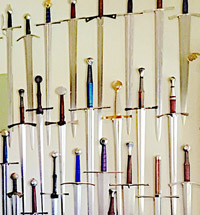 Otherwise, some swords could be identified by their apparent quality or a signature style associated with a famous smith. 3) Zanbatou or zhan ma dao were more common in China and were designed for killing mounted cavalry and their horses. They ARE historical and were fairly cumbersome and specialized. They were usually carried over the shoulder or with other weapons on a cart, etc and taken out when appropriate. In a fantasy setting, a particularly strong character could conceivably wield one as their primary weapon, but would need a smaller sword as a backup for fighting in confined spaces. It is a popular sword style in Anime and Japanese Manga, especially Rouni Kenshin. A similar style of Japanese sword is a Nagamaki. 4) Sword and Dagger, the difference: Generally speaking, a sword becomes a dagger if it is 14" or less in length (blade length). "Colonel D.H. Gordon, a British army officer trained in sabre and bayonet fencing pre-WWI suggested that weapons less than 14" long should be classified as daggers, 14-20" long as dirks, those 20-28" as short swords and anything over that length as longswords." 5) Difference between scabbard and sheathe: No, scabbard and sheathe are basically interchangeable sword terms. In the west, they were bascially either all leather or wood core with leather over the top. The belt was connected to the scabbard by something called a "frog". Google "sword frog" and you will see not a amphibian with a sword, but the connecting bit used to suspend the sword at the correct angle. In Japan, the scabbard is called a "saya" and is made of wood coated in lacquer. It is tied to the belt with a length of silk braid called "sageo" - the belt is called an "obi". Chinese scabbards were often natural wood colored or covered by cured rayskin and had numerous colored metal embellishments. In the west, most scabbards had two metal attachments, one where the blade goes in called the "throat" and another at the tip called a "chape". They could be simple or adorned. 6) Favorite sword: Hmm, that's a tricky one.. It actually varies, but I tend to like Katana, Chinese Dao and Viking Swords the most. 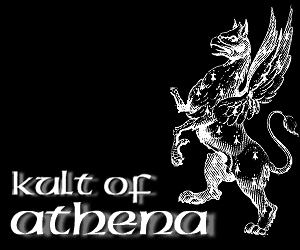 I also like well made fantasy swords, and of course, the ultimate sword - the light-saber..! Thank you so much for such an informative answer; I truly appreciate it!! No problems at all, if you get stuck again or wish to update us on your progress writing the book feel free to update this thread. 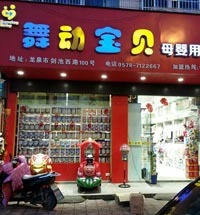 Best of luck with your project! I know virtually nothing about Asian swords, but I am the world’s foremost leading authority on European swords from AD 900 to AD 1200, if that helps. European Medieval soldiers did little things like temporarily straighten a sword blade on the battlefield, but there wouldn’t have been much sense in trying to. For one, it would take time, and that’s something a man didn’t have a lot of in the thick of battle. More likely, his squire would just hand him another one—shields as well. A knight would use a long sword on horseback, and switch to a shorter sword on the ground—and it was the squire’s job to make sure he had the right one. They kept armorers behind the lines, and at the end of the day’s battle they were the ones who kept all the weapons and armor straightened out, sharpened, and cleaned. (Believe it or not, Medieval battles were actually similar to sporting events today, compleat with boundary lines and spectators on the side lines. They would not fight all day long, but separate into small manageable groups and fight for a couple of hours at a time, then quit for the day and start again the next morning.) A Medieval peasant soldier would probably have been better at keeping his sword in good shape more than a knight, because he couldn’t have afforded a smith, and knights were not expected to do such menial tasks. 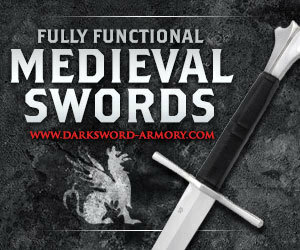 That said, not much went wrong with real Medieval swords in the first place. Unlike today, Medieval swords were made from bog iron which has silicon in it, which made for a much tougher blade than today. 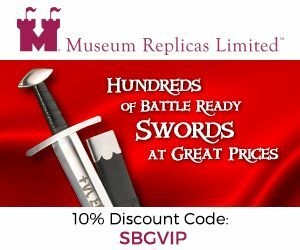 Most Medieval swords which survive today were damaged more from being in the ground for hundreds of years than from battle. People use the word sheath today, but in the Middle Ages they used the word scabbard—remember, both of these words are French and neither would be used in Asia. One modern general may have set the standard for the length of a sword today, but in the Middle Ages there was no such rule. The difference would have been: one you use in battle to kill people, the other you use to cut your food. Knives were rarely used in Medieval battles at all, and none were made for that purpose until very late—post 1400. And daggers were not used for sticking in your mouth. One really good piece of advice: Never use what you see in films, including documentaries, or read on the internet (except this, of course) if you’re wanting to write about the way it really was. Most everything people believe about the Middle Ages—be it European or Asian—is made-up fiction. You’ll need to read good history books written by good historians. If you’re just going to make up a fantasy story about a make-believe Time and Place then I guess it doesn’t really matter.